What's The Worst Vehicle Currently For Sale? It doesn't seem like anyone can sell cars in the U.S., which has more to do with economic uncertainty than desirability. Still, there's a lot not to like. What's the worst vehicle currently for sale? We're going to limit this to the United States because it turns out the Chinese sell more cars than us and we generally like what the European market is offering (Can you say Skoda Superb?). The worst-of-the-worst has to be the 2009 Pontiac G3, a car that represents everything that's wrong with the auto industry over the past 20 years. For starters, it's platform prostitution of the worst kind — a re-badged Chevy Aveo GM designed for dealers and not for customers. 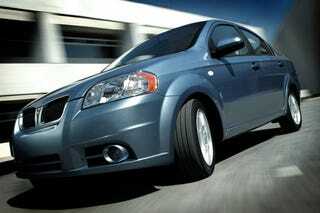 In fact, the Chevy Aveo isn't even the start of the re-badging. It's actually one step away from the original Daewoo-built econocrapbox. It may not be the ugliest car and, if we're honest, the interior's still probably relatively better than a Sebring convertible. But the reason the Pontiac G3 earns the superlative negative is what the vehicle represents. We were just starting to like Pontiac again. We couldn't heart the Pontiac G8 GXP more if we tried. We were craving the Pontiac G8 ST like anyone else with a love of cars with a truck bed. GM told us they were "building excitement" with a new, performance-oriented enthusiast-centric Pontiac brand. Where was the cry from enthusiasts to have yet another crappy econobox with no style, power or grace? Oh wait, there wasn't. But hey, here it is. Something to entice buyers to the lot with the promise of 34 MPG highway. Maybe we'd have gone with a Sync-less Ford Focus or a Toyota Venza as our top-of-the-worst choices, but then Pontiac went and killed the ST. Right after they revealed this little FWD crapmobile. A rebadged crapmobile. This car is the automotive equivalent of getting into a scrape and, instead of fighting, curling up into a ball and hoping you don't get kicked in the kidneys. They'll happily take a pre-order for the G3, which hits dealers soon. We won't be waiting in line and, we guess, neither will you.